"The spacecraft was drilled later, when it was fully assembled." 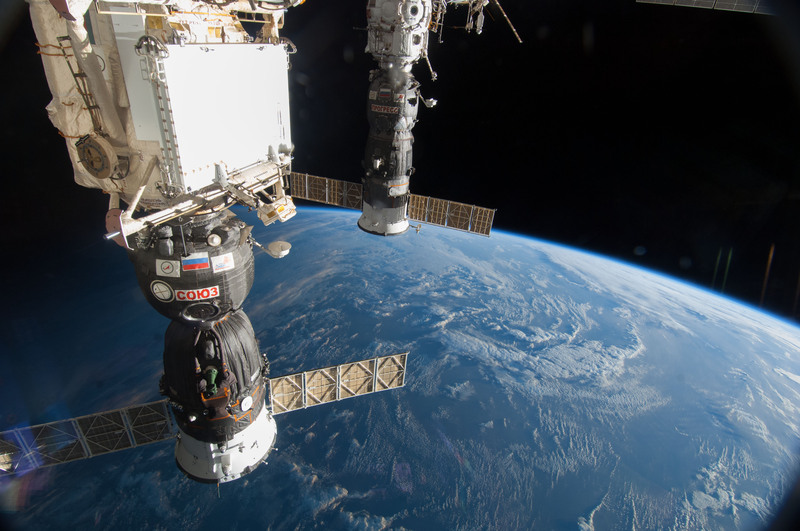 On Friday, Russia’s state-owned media outlet TASS reported that someone drilled a hole in the hull of the International Space Station, fueling conspiracy theories that have sprung up in recent weeks. On August 30, the crew of the ISS repaired a small hole, which was initially attributed to a micrometeoroid punching through a Soyuz MS-09 capsule docked to the ISS. In the time since the repair, theories blaming NASA astronauts for sabotaging the capsule have built steam in Russian news outlets, fueled by anonymous sources within Roscosmos, Russia’s space agency. The rumors had gotten serious enough to warrant a face-to-face meeting between NASA Administrator Jim Bridenstine and Roscosmos General Director Dmitry Rogozin, which will happen on October 10. On Thursday, NASA and Roscosmos issued a joint press release announcing the meeting, and it struck a conciliatory and diplomatic tone. Rogozin has publicly condemned the rumors and theories that NASA astronauts drilled the hole to force an emergency evacuation of a sick colleague, yet rumors published by TASS from within Roscosmos point to new evidence that someone drilled through the hull of the MS-09 capsule, damaging the meteor shield that surrounds it. Scratches near the hole found in the Soyuz MS-09 module docked to the ISS have led some to conclude that the hole was made by a power drill. “Traces of drilling have been found not only inside the spacecraft’s living compartment, but also on the screen of the anti-meteorite shield that covers the spacecraft from the outside and is installed 15 millimeters away from the pressure hull,” an anonymous rocket and space industry source told TASS. According to this individual, cosmonauts aboard the ISS had inspected the 2-millimeter hole with an endoscope and found evidence that a drill had damaged the shield, which was installed on Earth. Presumably this information comes from the ongoing Roscosmos-led investigation into the matter, even though NASA and Roscosmos have said no details would be released until the investigation was completed. In the TASS story, another anonymous source clarified that the Soyuz MS-09 module had been photographed after it was assembled, which seems to add credence to the idea that the hole was drilled in space. But the source also admitted there was a 3-month period after its assembly during which the hole could have been drilled while the craft was on Earth. “When Soyuz MS-09 has just arrived to the final assembly workshop, it was photographed in details. No hole and no signs of drilling… were found. The spacecraft was drilled later, when it was fully assembled,” TASS reports the source said. TASS added the caveat that it could not confirm any of this information at the time of publication. I look forward to our first face-to-face meeting at the Baikonur Cosmodrome in October, where we will view the upcoming Soyuz crew launch of @AstroHague and Russian cosmonaut Alexy Ovchinin. This report further roils the water around the ISS leak, which was minor enough that ISS crew member Alexander Gerst had covered it with his finger until the crew could work out a more permanent epoxy patch. Even though Rogozin remains the diplomatic public face of Roscosmos, going so far as to publicly condemn the rumors, officials behind the scenes seem intent on spreading a version of events in which NASA astronauts drilled the hole to force an emergency evacuation. This theory, which Russian news outlet Kommersant reports the Roscosmos commission is considering a top possibility, alleges that NASA did not want to pay for a new Soyuz module. Since an evacuation would have to involve both astronauts and cosmonauts, this scenario would theoretically keep NASA off the hook for the approximately $85 million cost of a new spacecraft. No evacuation happened, though, and the leak was so minor that ground control in Moscow and Houston agreed to let the ISS crew get a full night’s sleep before finding and fixing the pressure leak. But even with the physical leak fixed, it seems that information leaks are continuing to cause headaches for NASA. The Soyuz spacecraft is produced by Russian firm RKK Energia and is the only spacecraft model that currently carries humans between Earth and the International Space Station. Several private firms, including Boeing and SpaceX, are currently developing capsules that can transport astronauts to the ISS, with both companies expecting to deliver a product in 2019. A NASA/ESA-operated Orion spacecraft, which is being built by Lockheed Martin and Airbus, is also in development. Regardless of how this diplomatic mess shakes out, it’s only a matter of time before the US will be able to shuttle its astronauts to the ISS without help from Russia.